It's a cool fall morning here today - our furnace actually came on! A great sewing day (well, except for the fact that 3 eleven year old girls are sleeping over tonight and we apparently have 'lots of preparation to do' according to D". If we want to keep a Canadian magazine in business, we need to support it people! It has been a fantastically successful first year for Quilter's Connection; each of the 4 issues have just been better and better. Subscriptions for the quarterly mag are available for 1 or 2 years and YES, our neighbours to the south and overseas can also subscribe! That means you too, Canadian ex-pats! 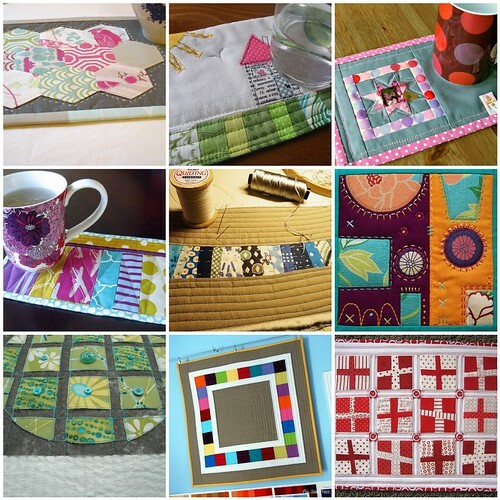 Stay connected with the quilting scene back home! Two-year subscription prices for us Canucks are comparible to what we pay to import the popular U.S. mags. So, go ahead and subscribe: ask your guild to take out a subscription for your library, or maybe purchase a year for your mom/aunt/grandma/sister, or in some fantastic situations, your quilting hubby! 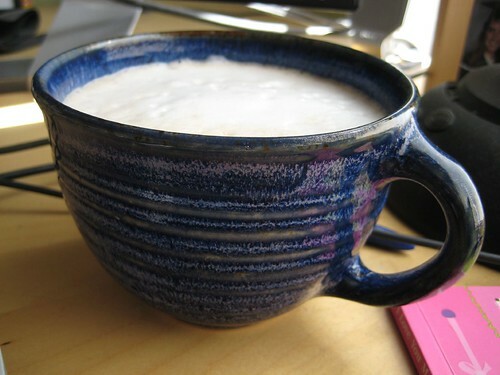 Soon my morning latte will be enjoying it's new mug rug! That's right, I've joined yet another swap over on flickr. We'll be making over-sized coasters for each other's mugs and the ones popping up so far have been amazing. I even cleaned my desk yesterday to make way for mine...lo and behold, I discovered a couple of coffee-ring stains under my keyboard, so I need that rug pronto (I believe I've mentioned here before that housekeeping is NOT my strong point)! Here's the inspiration mosaic I put together for my partner. Hope you are enjoying the long weekend! School starts in 2 short days. Wooohoooo!!!! Sewing room, here I come! 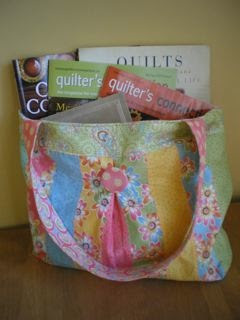 I hope Quilter's Connection keeps growing! I take for granted that most of the magazines I do read are based in the US and tailor to our residents. And of course with all Canadian contributors, hopefully that means more features for you! I worked a little on a possible mug rug yesterday... I don't know my partner, but she does have fun tastes. Congratulations on having a pattern published in this wonderful Canadian magazine. I got my magazine the other day and I just love your pattern. It's gorgeous!! I need to renew my subscription too! This is a great magazine!!! So neat about your having your pattern in that magazine. Enjoy your latte and sewing! 1. that is a gorgeous bookbag and can't wait to see yours. 2. Those mug rugs are too cool, I need one! 3. I wish I could make mosaic photos! Yes, ditto on making the mosaic pictures. I wish I could do that also. Great pottery cup, and that cute book bag looks like a good size - not too big.